We begin our cycling on the North end of Prince Edward Island (PEI). This week we'll enjoy the peacefulness of cycling on the Confederation Trail much of the time, an old railroad line which runs tip-to-tip from Tignish to Elmira. The Confederation Trail has 300 miles of excellent paved and rolled surface for cycling. 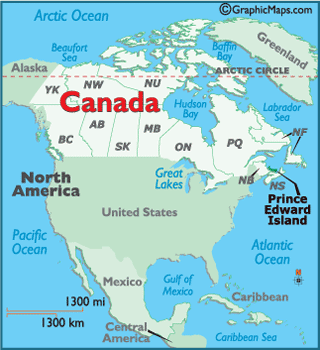 Prince Edward Island is known as Canada's "Food Island". PEI takes farm-to-table to a whole new level. With an abundance of fresh, local ingredients from land and sea, we'll enjoy a unforgettable fresh food vacation. We'll be spending our week exploring the seaside towns and beautiful countryside. Museums are plentiful on this historic island. Adding to our comfort on this tour, we will have our luggage shuttled for us by a local shuttle company. Our overnights are a mixture of B & B's, cottages and resorts. No need to ship your bicycle. 2018 Specialized Hybrid bicycles are available for $180 for the week. In an effort to keep costs as low as possible for individuals, most lunches, alcohol and dinners are not included in the price. We'll have dinner reservations for our group each night. The cost estimate for individuals meals for the week is $200 per person and up. It all depends on what you decide to eat. Day 1: We will have a welcome meeting at the cozy Sonata Inn, in Charlottetown, PEI at 4pm in the breakfast room. I will pass out maps, go over safety and answer any questions you might have. Following the meeting we’ll all walk to dinner at a nearby locals favorite restaurant. Day 2: In the morning after breakfast we’ll be shuttled to The North Cape Lighthouse, where we’ll begin our week of riding. We will cycle past scenic coves, lighthouses, and Provincial Parks. We can join the Confederation Trail (CT) in Tigish, or chose to continue riding on the North Cape Coastal Scenic Drive rt. 12. Total 31.9 miles. Day 8: In the morning we’ll have a breakfast at our Inn. If needed our shuttle will show up early to take anyone who has to get to the airport early. The shuttle will shuttle everyone else back to Charlottetown, or where ever you need to be dropped on the island. In an effort to make DamselTours affordable for all women we offer sliding scale, 3 tiered payment system. All participants receive the same tour experience no matter which level they choose. All payments are kept strictly confidential. Level one is lowest price in order to join the tour. Level two is for those women who can afford slightly more. While level three is for those who can afford a slightly larger payment.